The biological younger sister of JYJ member Kim Jaejoong was revealed. 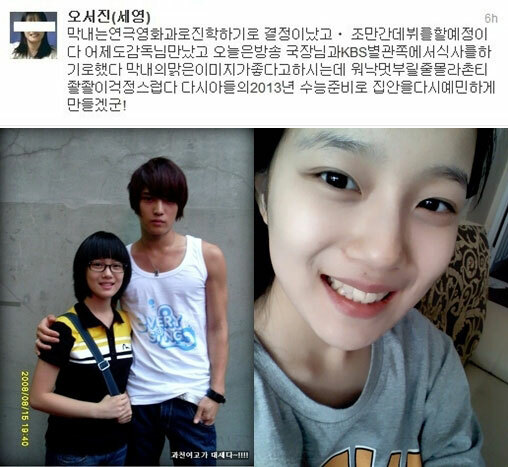 The photo is the screenshot of the text wrote by Oh Seo Jin, who is born by biological mother of Kim Jaejoong, when she tweeted on Twitter that read, “Youngest child decided to go for theater and film department, plan to debut in the near future,” implying that the sister of Kim Jaejoong will debut soon. Then the photo of Kim Jaejoong and her sister was posted. In the photo, Kim Jaejoong’s sister shows off her pure image with delicate facial features and flawless skin. In particular, it’s amazing that she looks very similar with Kim Jaejoong. Netizens commented on the photos, “Sister looks familiar,” “Looks like Han Sun Hwa?” “Looks the same with brother,” and so on.